John C. Calhoun, long a champion of southern rights, devoted his final days to opposing the Senate's Compromise of 1850. The Mexican War was over. Every goal set by the United States government when declaring war against Mexico was reached — and then some. The ports of California were now under the United States flag. In fact, the United States increased its territory by more than one third as a result of the Treaty of Guadalupe-Hidalgo. One would expect Americans to rejoice and come together in a burst of postwar nationalism. These were not, however, ordinary times. The land obtained from Mexico quickly became the subject of a bitter feud between the Northern Whigs and the Southern Democrats. Abolitionists rightly feared that attempts would be made to plant cotton in the new territory, which would bring the blight of slavery. Slaveholders feared that if slavery were prohibited in the new territory, southern slaveholding states would lose power in Congress. The Compromise of 1850 settled the issue of slavery temporarily, but may have further divided the country along the lines of slave and free territory. Even before the treaty ending the war had been ratified by the Senate, both houses of Congress became the scene of angry debate over the spoils of war. Congress represented every political philosophy regarding slavery. Legal scholars discussed the right of Congress — or anyone else — to restrict slavery from the new lands. The specter of secession had risen again. Desperately the elder statesmen of the federal legislature proposed methods of keeping the country together. The country's founders left no clear solution to the issue of slavery in the Constitution. Popular sovereignty, amendment, nullification, and secession were all discussed as possible remedies. Conflict was avoided with the passing of the Compromise of 1850. The cooler heads prevailed — this time. 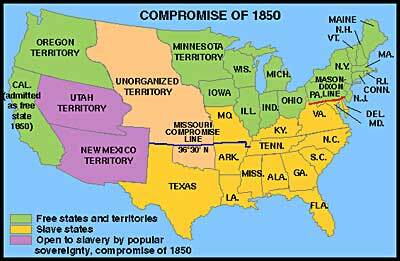 The Compromise of 1850 didn't just slice up the United States, it divvied up the state of Texas as well. Take a look at the plans to cut up the biggest state in the Union. As a young lawyer Henry Clay defended Aaron Burr before grand juries — two times. Before Clay, Calhoun, Compromises, or even Congress -- Daniel Webster was just a college kid at Dartmouth. Find out about the younger years of this 1801 graduate.